What happens if a method is just a wrapper for another method? Is the extra jump optimized away by compiler? Does it take much time? I thought I’d look into this and measure a bit. With the different compilers, Jits and runtimes I thought it would be fun to see what happens. I’ll use a == operator implementation calling IEquatable<T>.Equals(T other) for testing. A good practice when creating structs is to implement Object.Equals , GetHashCode() , IEquatable<T> , op_Equality (== operator) and op_Inequality (!= operator). (Read more on Microsoft docs.) Since Object.Equals(object) , Equal(T other) , op_Equality and op_Inequality all more or less implement the same logic I figured one could just call the other. So whats the cost? Note that this is not for optimization. The cost we are talking about here is negligle compared to the rest of your code, so this is purely for fun. And this is not an attempt to measure the cost of an additional JMP, which is well documented and even varies depending on scenarios. Public variables and using Count for something after run, since thought I had some issue with RyuJit being too smart. This one is pretty much as we would expect. My first question was whether the extra jump would be optimized away. I can’t see that from decoding the method directly, but we see for reference that it loads the argument and calls Equals on the struct instance. Pretty much as expected. So how about callee? Is it optimized away? No, it is calling op_Equality which in turn is calling IEquatable<T>.Equals(T other) . All of this is before Jit. So lets see how it performs with some test runs. For the test I’m doing a lightweight operation where I am comparing three int’s and it will fail on third. For the most part we can see a penalty of 8% to 19% in our simple test scenario. Neither compilers/JIT’ers optimize away the jump. 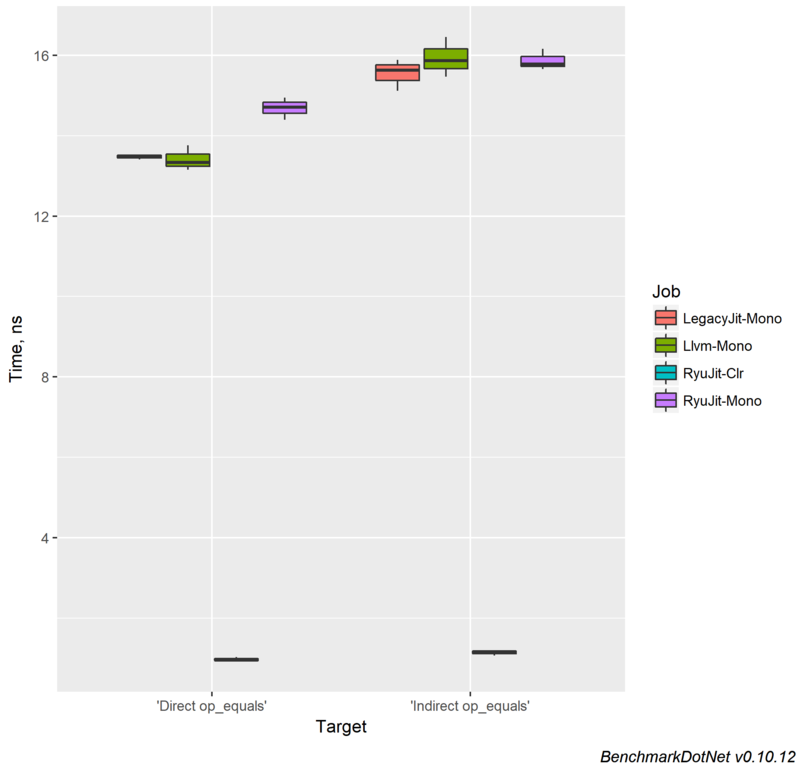 However we can see that RyuJit on Clr is doing some black (register?) magic here. It stil has the relative overhead of 18%, but it is much faster than the other runtimes.